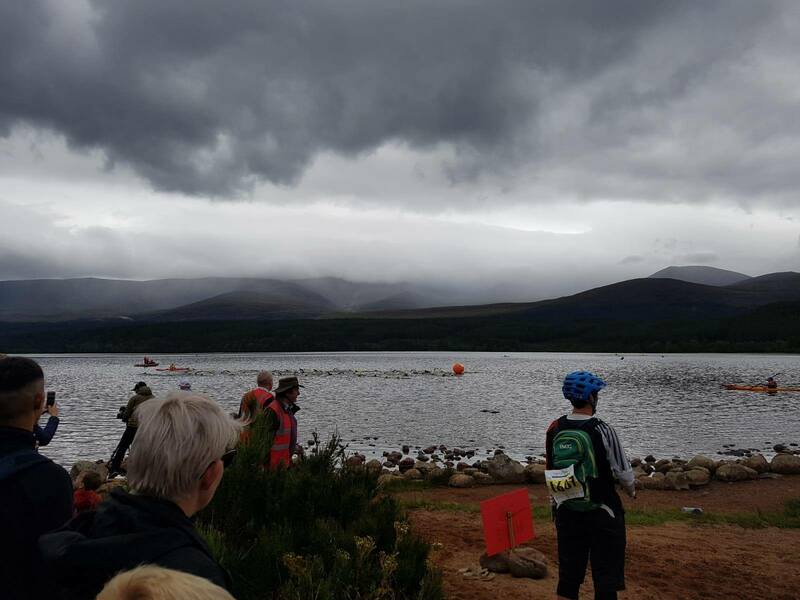 Gillian and Chris travelled to Aviemore to take part in the Aviewmore Open Water Sprint Triathlon, read on to find out how they got on. We had two club members taking part in the Aviemore Open Water Sprint Triathlon on Sunday 12th Aug; Chris Davidson and Gillian Kennedy. Not the best racing weather of the season, but that didn't stop our determined triathletes. This triathlon is an off road sprint tri with a 750m Open Water Swim, 12km Mountain Bike and 5km Trail Run. This is the 2nd triathlon that I have taken part in but the 1st one that I did some actual training ahead of! Leaving Perth at 5am to get up to Aviemore for registration at 7am I was full of nerves not having raced for a while and with only a couple short brick runs under my belt. The weather on the way up was pretty shocking but thankfully by the time Aviemore arrived it had cleared, overcast and cool was the flavour of the day. Registered and set up at transitions I spotted Gillian waiting for the race briefing, a bit of chat and a few pre race words of advice was very welcome. Race start arrived and we were in the water for a deep water start, a toasty 17 degrees! The air horn went and we were off, I put myself at the back of the swim pack but my mix of breast stroke and front crawl managed to pick off a few places. By the time we hit the first buoy the wind had kicked up a bit of swell but nothing drastic, it was the exit from Loch Morlich that created a bit of entertainment for spectators, the long shallow rocky exit had competitors tottering and crawling on all fours to get out. T1 came and went, taking Gillians advice I decided to stick with my swim shorts for the duration instead of trying to change. Onto the bike and initially I felt a bit zapped, but soon realised I was feeling strong, it was on the bike I started picking my way through the field, the buzz from passing quite a few competitors was great but I kept reminding myself that I still had a 5km run to knock out! The MTB lap finished with a lap of the Badaguish jump track, I loved it, most looked pretty uncomfortable. T2 arrived and I wondered what my legs would do as I laced up my trainers, off I went and immediately felt good, settled into a pace and negotiated the narrow tracks through the wooded area by Badaguish, bit of fire road and some more forest trails later, I finished the sprint in an overall time of 1hr 33mins 11 seconds. 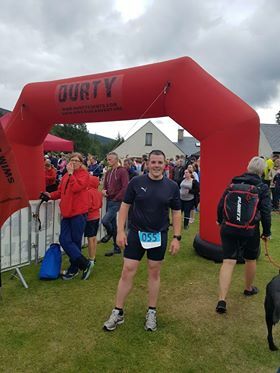 If your keen to try an off road tri I can thoroughly recommend a braw day out in Aviemore, the event was great, well run, lots of support and very scenic. I'll be back next year for the long hard durty! Superb racing Chris, especially as it was only your second triathlon - a bit of training can make all the difference! Great racing Gillian, doesn't sound like an easy cycle and well done on coming 2nd place in your category.